You May Now Fly to the Moon, Literally! “One small step for man, one giant leap for mankind” is a legendary saying by Neil Armstrong, which you may soon be able to say while standing on the moon yourself. Space Exploration Technologies Corp, popularly known as SpaceX, is apparently sending the first private passenger on the moon. The Elon Musk owned company, without saying much else, tweeted this news today. 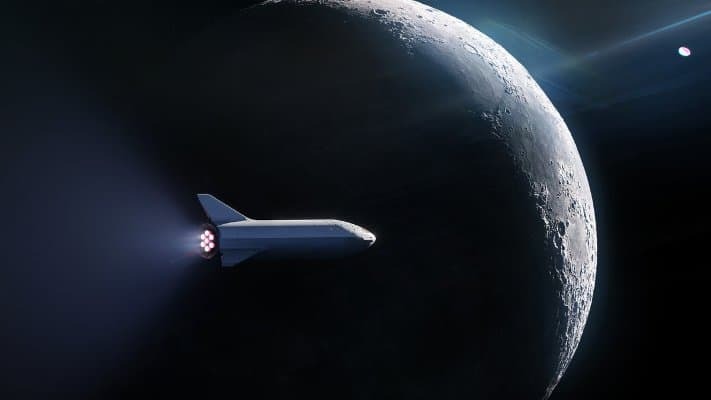 “SpaceX has signed the world’s first private passenger to fly around the Moon aboard our BFR launch vehicle – an important step toward enabling access for everyday people who dream of traveling to space. Find out who’s flying and why on Monday, September 17,” said the tweet. SpaceX says that with this initiative, they have taken an important step towards enabling access for everyday people who dream of traveling to space. Apparently only 24 human beings have been to the Moon in history and after the last Apollo mission in 1972, no one has visited the moon. SpaceX has also provided the link for the webcast that will probably go live on Monday, 17 September. Elon Musk, the Internet entrepreneur, has confirmed on Twitter that this is new version of BFR and when someone tweeted saying the BFR looked “very tintin-esque”, he replied saying “Intentionally so”. Space Exploration Technologies develops and operates the multi-use rocket launch vehicles called Falcon rocket family. Also, the SpaceX reusable launch system development program is working on developing new technologies for an orbital launch system that may be reused many times in a manner similar to the reusability of aircraft. Some of the technologies developed by SpaceX to do the same are as follows: restartable ignition system for supersonic velocities and high transonic velocities, altitude control for non-destructive return of spacecraft into earth’s atmosphere, hypersonic grid fins and navigation sensor suites to enable precision landing, throttleable rocket engine technology to reduce engine thrust, large-surface-area thermal protection system to absorb the heat load, and so on. A technology like this could ensure safe travel of human beings into space and back. However, SpaceX is the past too had made similar announcements on which there is no update available even today. SpaceX is also a key commercial partner to NASA, and is working on a crew ship that will make its first flight to the orbiting International Space Station next year. You May Now Fly to the Moon, Literally! 0 out of 5 based on 0 ratings. 0 user reviews.